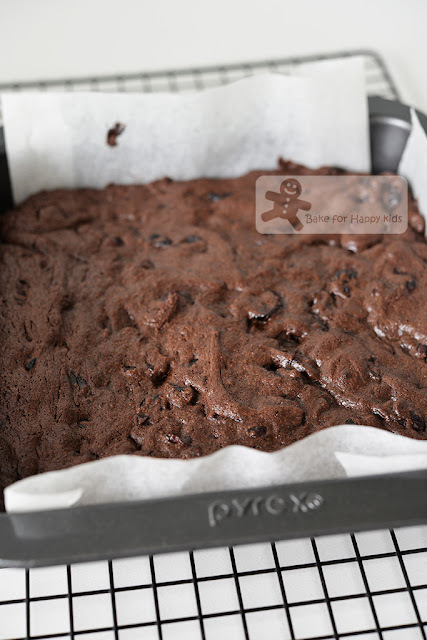 Bake for Happy Kids: Chocolate Cranberry Brownies - Another BEST Brownies Recipe! 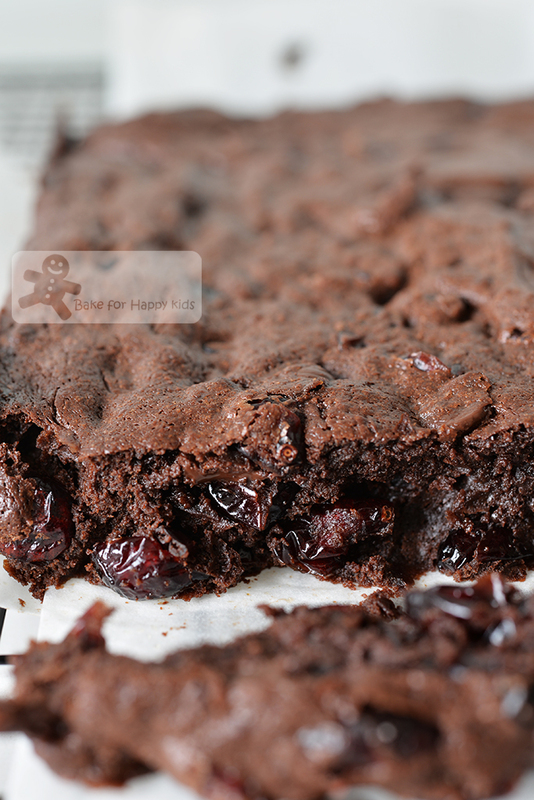 Chocolate Cranberry Brownies - Another BEST Brownies Recipe! Remember the BEST Chocolate Brownies that I have baked at here? Gosh! I love those maximally chocolate loaded Super Tok Kong* brownies!!! Oh! I know that!!! Like the BEST Chocolate Brownies that I have baked at here, these chocolate cranberry brownies are also baked with maximum amount of chocolate and minimal amount of butter, sugar and flour!!! Plus, these brownies are Christmasy and extra chewy with added cranberries. Very very very heavenly delicious... the taste is like the lovely combination of fruit and nut chocolate but with no nuts of course. LOL! *Tok Kong means superb or the best in Singlish / Hokkien. Made with maximum chocolate and minimal butter, flour and sugar! Can you spot the similarities and differences between the BEST Chocolate Brownies that I have baked at here vs THIS Chocolate Cranberry Brownies recipe? The BEST Brownies recipe contains 270g dark chocolate, 75g unsalted butter, 130g sugar (1:1 caster:brown), 55g plain flour, 1/6 tsp baking powder, 10g cocoa powder, vanilla and salt. This Chocolate Cranberry Brownies recipe contains 280g dark chocolate, 75g unsalted butter, 150g sugar (I have used 1:3 caster:dark brown), 45g plain flour, NO baking powder, NO cocoa powder, vanilla and salt. Plus 150g dried cranberries that are plumped up with water and sweet alcohol. Can you see that this Chocolate Cranberry Brownie is also made with maximum chocolate and minimal butter, flour and sugar? Did I use alcohol to bake this brownies? Yes. I have used rum and water to plump up the dried cranberries before adding the cranberries into the brownies mixture and it is an essential step to make the added cranberries to be extra moist and tasty. Is there any alcohol in these brownies? No. The small amount of alcohol will vaporise off when the cranberries are cooked and cooled and any minor leftover alcohol will eventually vaporise off when the brownies are baked for 25 mins. Trust me... I can't taste or smell any alcohol in this brownies or if you prefer your brownies to be absolutely alcohol free, you can substitute the alcohol with any juice or just water. However, if you like your brownies to be rather boozy, you can brush a layer of sweet alcohol like rum or sweet wine like Marsala and Botrytis Semillon on the baked brownies when it is completely cooled so that alcohol content won't completely vaporised off. This is my freshly baked extremely chocolaty cranberry brownies. Can't wait... Must slice and taste some now!! YUM!!! It's heavenly!!! ... being so rich, chewy and fudgy! 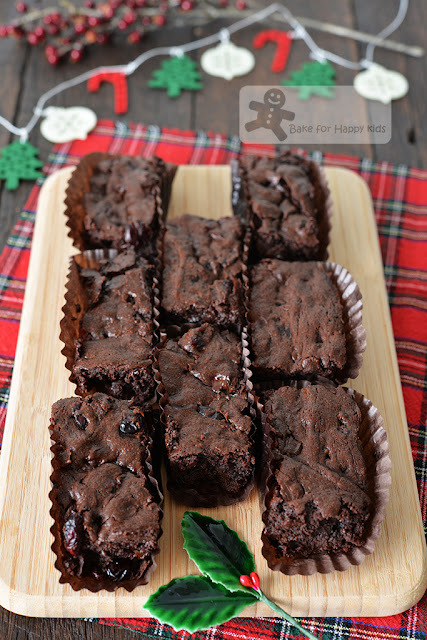 Are you fully convinced that this chocolate cranberry brownies is also super Tok Kong and very yummy? Here's a video showing how I baked this brownies. It's really easy!!! Just melt, mix and bake!!! Here's the recipe that is adapted from the book, Baking Chez Mo by Dorie Greenspan. 110g (4 ounces) dark chocolate, chocolate chips or roughly chopped - I'm using Callebaut dark chocolate callets with 70% cocoa and my brownies is very chocolaty and not too sweet. Combine dried cranberries, water and wine in a small saucepan and cook with low heat for about 5-7 mins or until the liquid has been fully absorbed into the fruits. Set aside to cool completely. This step will cause the alcohol added to vaporise off. Place 170g chocolate and butter in a large heatproof bowl. Melt and stir chocolate mixture by using a microwave, pulsing with low power or placing the heatproof bowl over a saucepan of simmering water. Stop heating immediately when the chocolate are just melted as over-heating can cause the chocolate and butter to separate. Mixture should be thick, smooth and shiny. Scrape batter into the prepared pan and use a spatula to smoothed the top. Bake at 160°C for 25 mins or until the top is set but still soft in the center. Please do not over-bake brownies! Allow brownies to cool enough to set in the pan, about 20 mins or more if you are living in a warm place. If you prefer your brownies to be a little boozy, you can brush a layer of sweet alcohol like rum or sweet wine like Marsala and Botrytis Semillon on the baked brownies when it is completely cooled so that alcohol content won't completely vaporised off. Keep brownies in an airtight container at room temperature for up to 3 days.